Children should not be encouraged to think of a new pet as just another toy under the Christmas tree. It's a good idea to separate the idea of presents and toys from the realities and responsibilities of pet ownership. Not to mention that many pets acquired this time of year benefit puppy mills, pet stores, irresponsible breeders and other disreputable individuals and businesses who keep puppy mills in operation. Family Watchdog wants to highlight 5 reasons why giving a pet as a Christmas present may backfire on you in the long run. 1. The holidays are already crazy. The last thing your family needs right now is a new pet to train, get to know and learn all the special requirements. That cute puppy? Well she needs to go outside in the snow and pee 800 times an hour (almost as much as your toddler) - and that new lizard you just purchased - it needs a special lamp that costs $80. Don't forget to add that onto the holiday shopping list. Oh and now the new kitten is allergic to the cat food you have always used. 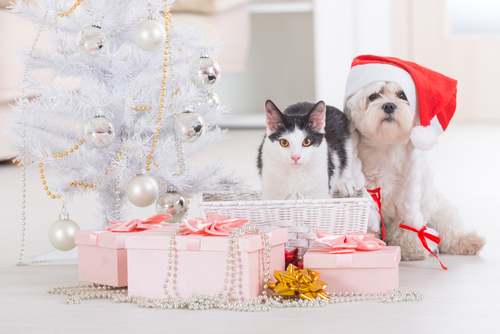 Time to schedule a vet appointment on top of all your Christmas activities you already have planned. 2. Pets should not be surprises. Have you had time to talk over the idea of getting a new pet with your entire family? Who's responsibility will be training? Who is in charge of taking the puppy out to use the bathroom? We know, it's hard to resist a little golden retriever under the Christmas tree on Christmas, but is now really the best time? By planning for a new pet, you may get a better understanding on what your partner or children are looking for in a new pet. Do they want the same breed of dog that they grew up with or maybe something different this time around? 3. A new pet should not be viewed as a new toy. New pets are a lot of responsibility - your child may do fantastic with the responsibility for the first few weeks or so, but what happens if they loose interest? By separating a pet from a "Christmas present" to a "family responsibility" you are giving that pet a fair chance at getting trained properly and not having the family loose interest as fast. 4. Puppy Mills, Pet Stores and Breeders pump up their "stock" this Holiday Season. Ever wonder how the pet store has so many pets for sale around the holidays? Breeders always pump up production around the holidays to make sure they can get rid of all their "stock". Do not support these Puppy Mills or Backyard breeders, you could get a sick dog or one with future health issues. When the time IS right for you and your family to look into getting a pet, Family Watchdog suggests looking at animal shelters or rescues. Many of these dogs are older, which means they are already trained (bonus) and just in need of some really good love! If your looking for a specific breed, you can almost always find a good rescue group within driving distance! 5. Pet stores may not have the best advice. Do your own research first. Hit the internet and Facebook groups. We rushed into buying a lizard years ago from a pet store - little did I know EVERYTHING I bought for Lurch the bearded dragon was wrong. The cage, the colored lights, the food. I had to redo everything and it cost me hundreds to make his enclosure safe and healthy for him. Now I have cockroaches breeding in a container under his tank. Yikes! Did I expect to do this? NOPE! If I would have done just a bit of research before buying this cute (then, little) lizard, I would have probably veered off the whole breeding cockroaches thing! Don't get us wrong, there are HUNDREDS and THOUSANDS of families that adopt pets around the holidays and it works out great for them. We just wanted to make sure you have thought everything over so your new family pet does not end up in the shelter or with some major health issues. Is there anything you can add for other readers to catch up on? Tell us bellow by commenting!